I love soft shell crab and hate regular crab. It takes too much work for that little bit of meat so if I can eat the whole thing, I’m going to like it more. Yes, I’m lazy. It is also the reason why I don’t like eating that shrimp dish where they simply boil the shrimp. And you have to peel the shrimp and dip it in soy sauce. Too much work. Though I love the salt and pepper shrimp. Deep fried goodness that I can just eat it with shell and all. 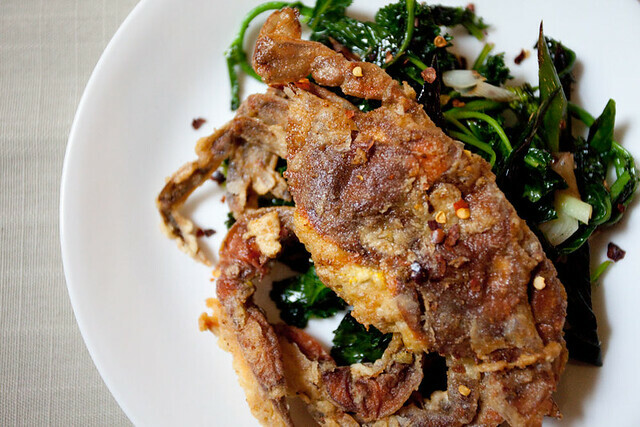 I’ve been wanting to cook soft shell crab myself but it just never happened until I was inspired by Sarah Simmons of City Grit, when she made THIS. This dish was quite simple to make. Three main ingredients. Crab, kale and spring garlic. In a pan I sauteed the kale and spring garlic with a dash of red chili flakes (and salt and pepper to taste). While the veggies were cooking, I seasoned some flour, dunked the crab in the beaten egg and drenched it in the flour. In another pan, on high heat, I added oil and a knob of butter. I fried the crab in the oil and butter mixture til golden on both sides. For an extra kick, I sprinkled more red chili flakes onto the dish.